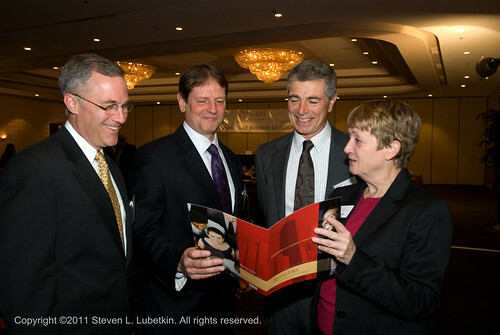 Examining a Rutgers Camden publication before the program were panelists (from left): Brian Clapp, chief operating officer of Career Concepts Inc.; Mark Remsa, director of economic development and regional planning for Burlington County; Herb Taylor, vice president and corporate secretary for the Federal Reserve Bank of Philadelphia; and Dr. Gayle Porter, professor of management at Rutgers School of Business-Camden, who moderated the program. Lubetkin Global Communications LLC is pleased to present the Fourth Quarter 2011 Rutgers University School of Business at Camden Quarterly Business Outlook. The Rutgers Quarterly Business Outlook podcast returns to free downloads in 2011, thanks to generous sponsorship support. This quarterly forum, presented by Rutgers University in cooperation with the Chamber of Commerce of Southern New Jersey and sponsored by the law firm of Flaster Greenberg, features South Jersey area business leaders who assess the Southern New Jersey economy in their business sectors. This program was recorded on Tuesday, October 18, 2011, at the Crowne Plaza Hotel, Cherry Hill, NJ. Herb Taylor, vice president and corporate secretary, Federal Reserve Bank of Philadelphia. Mark Remsa, director of economic development and regional planning, Burlington County. Brian Clapp, chief operating officer, Career Concepts Inc. Subscribe to the RSS feed for the Rutgers Quarterly Business Outlook podcast. Special thanks to Samantha Collier, director of external affairs, Rutgers University School of Business, Camden, and Michael Sepanic, Director of Public Information, Rutgers University, Camden, for their interest in promoting podcasting technology. These podcasts are also available for commercial sponsorship. Please let us know if you or your company is interested in sponsoring our programs.